Manufactured in France from Circa 1920 until 0. The problem with the cameras manufactured or diffused by Manufrance, they is that they are often called “Luminor”, therefore two different cameras can have the same name. 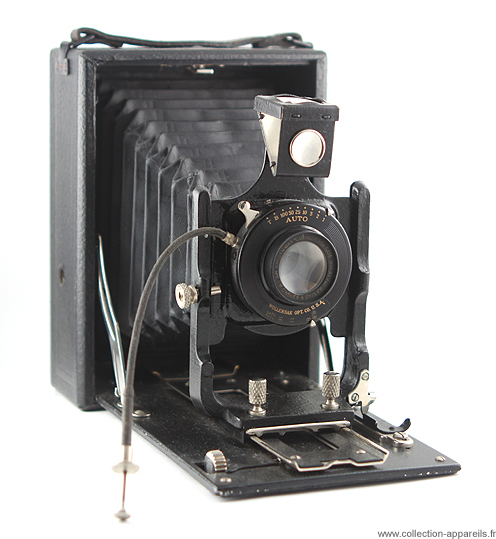 This Luminor is a camera with plate of format 9 X 12 cm. The body is made of wood and the flap made of metal. The unit is covered with a fabric imitating leather or a cracked black painting. Its identification is possible thanks to a small metal plate riveted on the right side. The name Luminor is also registered on the handle. A number (7075) is engraved under the base of the body. The lens is marked: anastigmat“Luminor” F:6,8 F=135 Mre Fse d'armes et ccyles de St Etienne. The shutter is Wollensak (the USA), of which speeds go from 1/100 secondes to 1 secondes, with exposures B and T. It is probable that the lens is also of the same mark.